« Win Ravens vs. Redskins Preseason Tickets! 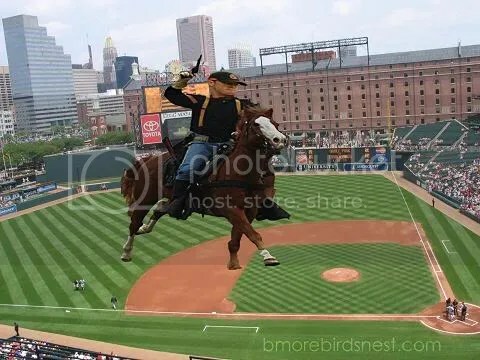 The cavalry is coming, here, O’s fans. We’ve been reciting this mantra to ourselves for nearly 2 years now (sometimes creepily repeating it over and over with our knees tucked to our chests, rocking back and forth, while Rich Hill does his best Rick “Wild Thing” Vaughn impressions – what, that’s just me? Liars), and with this week’s call-up of Chris Tillman, it is finally materializing. For whatever nonsensical reason, Andy MacPhail Dave Trembley wants to give the 1-2 shitshow of Hill and Jason Berken another chance to embarrass themselves shine (last use of strikethrough this post, promise), Tillman will get the pleasure of making his major league debut against the only man on the Kansas City roster that even resembles a major league pitcher, Zach Greinke. Greinke is 10-6 with a 2.04 ERA in 2009, good for BEST IN THE MAJORS. So yeah, good luck, Chris. On the bright side, Greinke is 1-2 with a 7.43 ERA lifetime against the Birds, so who knows, maybe we’re his kryptonite. Oh, what’s that you say? Greinke pitched 7 innings and gave up just 1 run the last time he faced B’More? Awesome. Kansas City is about the closest thing to a minor league batting order that Tillman could hope to face in the majors, a good way to ease in to things, but it still seems like it would have made more sense to let the kid go against Bruce Chen (0-5, 6.58) or Brian Bannister (6-7, 3.76) on Monday or Tuesday. Whatever. This entry was posted on July 27, 2009 at 2:35 pm and is filed under News, Orioles. You can follow any responses to this entry through the RSS 2.0 feed. You can leave a response, or trackback from your own site.